What Does a Roundworm Look Like? Fleas and flies are organisms that are both categorized in the scientific phylum Anthropoda, class Insecta. Also, fleas and flies are known to be carriers of disease to other animals and humans. However in spite of some similarities, fleas and flies are distinctly different creatures with varied traits and habits. Flea is the common name for wingless insects that are members of the order Siphonaptera. They have hard, flattened bodies and sucking, piercing mouthparts. Fleas generally grow up to one-eighth of an inch long, and are typically brownish in color. Though flightless, fleas have three sets of legs that are used to jump distances as long as 16 inches horizontally. Fly is the common name for winged insects that are classified in the order Diptera, which means “two wings.” There are 16,000 varieties of flies in North America alone. Flies come in a wide array of colors and sizes ranging from 0.06 to three inches in length. However, all are distinguished by a pair of functional forewings and a reduced, second pair of hind wings, called halteres. The halteres are leg-like in appearance, and are presumed to be used for stabilization, equilibrium or airspeed detection. While fleas and flies share the same class, they are further categorized in different orders. Within the flea order, Siphonaptera, there are approximately 1,500 species of fleas worldwide. 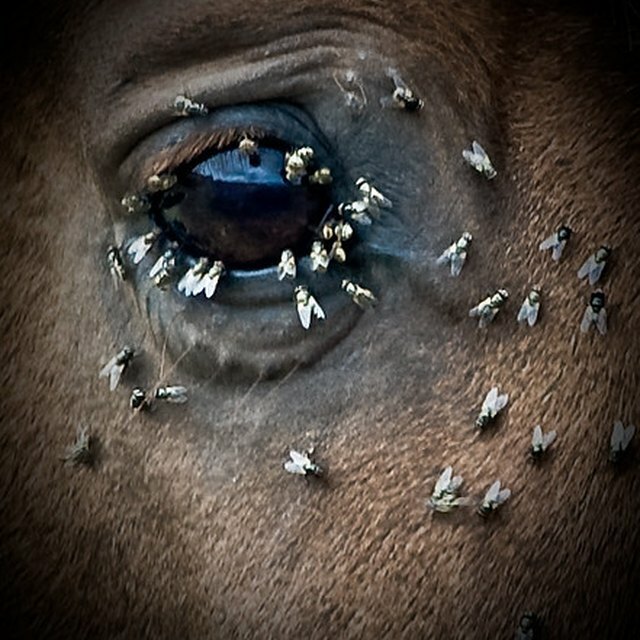 However, the order Diptera encompasses more than 90,000 species of flies throughout the world. Flea larva consumes debris from organic sources, especially adult flea feces. However, fly larva feeds off of rotting organic material, typically flesh and plants. Some fly larva are parasitic. Adult fleas are parasites that only eat blood; whereas adult flies consume a wide array of food including garbage, excrement, animal food and human food of all types. Fleas occur worldwide as external parasites, attaching themselves to the skin of bird and mammal hosts. While humans, dogs, chickens, rodents, rabbits and other wild animals are frequent flea hosts, cats are the most common host in North America. On the other hand, flies make their homes among garbage and wherever feces are accessible. Fly resting spots are indoor and outdoor objects such as on plants, walls, ceilings and fence wires. Flies occur in every area of the Earth, except on polar ice caps. A female flea can lay four to 40 eggs a day, whereas female flies lay one to 250 eggs at one time. While flea eggs hatch within 14 days, fly eggs hatch within 24 hours. Both fleas and flies enter a larva stage upon hatching, with the fly larva usually called a maggot. During the transition from larva to pupa, most fleas and flies produce a protective encasement in the form of a silk-like cocoon. However, the flea pupa stage lasts from one day to one year, depending on the species and environment; the duration of the fly pupa stage is usually within 10 days. Fleas generally live up to 14 days, with some reports of 113 day life span. 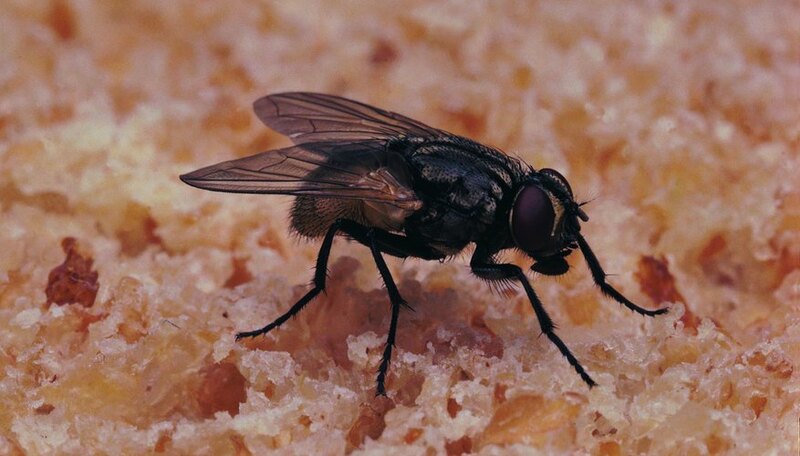 Flies have a life span of 15 to 30 days. Sigust, Andrea. "The Differences in Fleas & Flies." Sciencing, https://sciencing.com/differences-fleas-flies-10036950.html. 25 April 2017.